I wanted to take a moment to catch everyone up to speed. I am extremely tired and I apologize if this post is all over the place. Ana was seen at MUSC last Friday and the motility specialist was in agreement that the children's hospital in Columbus, OH was our best option for her current issues. We will be there for treatment until the 20th and hope that this will either correct her current issues or get her by until the summer. She will not be having surgery. If she does need surgery then it will happen on a return trip, but NOT this trip. We did speak to the RMH and it is looking like we will most likely have a room when we arrive tomorrow between 1:00am and 2:00am. God is so faithful! Travel mercies. We are driving at night and will be arriving in the wee hours of the morning. We have never been to Columbus and pray that God will make this an easy trip. For our children who are staying home. Two of them have minor illnesses and need prayer for quick healing. For my mom who will be holding down the fort while we are gone. For success with the treatment. Pray for the doctors wisdom and that God would guide their decisions. Pray a special pray for all of those who have come along side us through all of this. I could never fully express my gratitude to you, but know that I thank God for you. I will update once we know more. Thank you so much for your prayers and support. 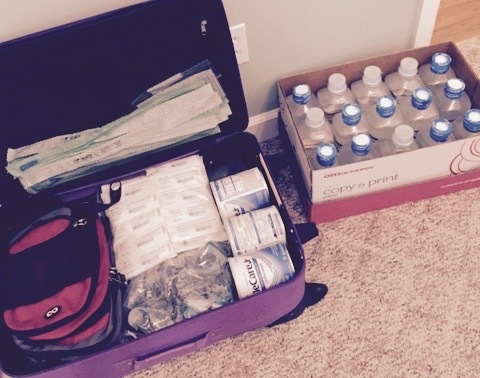 Almost done packing medical supplies!